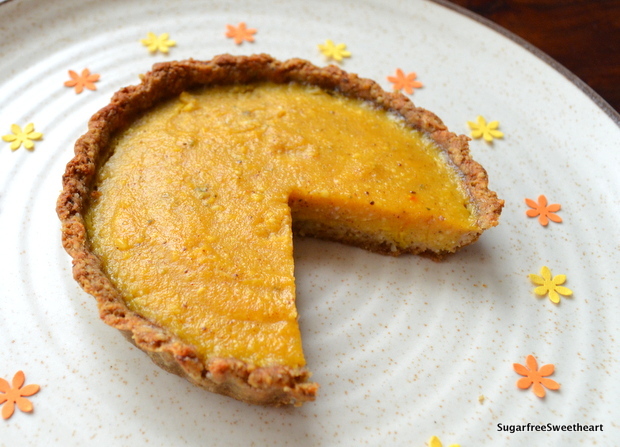 When the organic vegetable store we shop at began stocking butternut squash (a.k.a butternut pumpkins), I was drawn to its unusual shape and the possibilities of pumpkin desserts. At home, I was thrilled to find mildly orange inside! After a lot of pie recipe browsing, I decided to make this as-healthy-as-possible pumpkin pie. This pie has to be eaten fresh, or else the crust goes soft and then it’s just not the same! The great thing about this pie (apart from the taste, of course!) is that it’s not too carb-laden and has a lot of nutritious ingredients including almonds, oats, sunflower seeds, pumpkin (vitamins A and C), and cashews. As always, enjoy in small quantities and share with friends and family! If you have access to canned, unsweetened pumpkin puree then use that to make a super easy and quick version of this recipe. If you are making a large pie instead of mini ones, rolling out the crust dough may be easier than flattening it by hand. The crust goes soft if the pie is kept for a few hours so serve immediately! great recipe, amazing illustrations! I’m so glad i found your blog! Thanks so much Bea! Am eager to check out yours now! What is it with my browser today? I’ve tried to post this comment like 17 times already! The presentation is simple and elegant. I’m thrilled that the recipe is diabetic friendly. You have no idea how much good karma this is bringing your way! Yup, you can omit the sunflower seeds totally. You could add another date to mix for more texture and gooeyness, if you like. I think the normal sambar pumpkins will work just fine. As long as the pumpkin variety that you choose has a little natural sweetness and some colour when cooked then you can use it for this pie! the presentation is beautiful! Question: Can I use those orange Pumpkins? You know the ones we use in south Indian sambar? Orange coloured ones? Great recipe Priya ! I am saving it to make…very easy and healthy too! Looks delicious! I love pumpkin pie. Your illustrations are so wonderful as well!